Then, if that wasn’t enough, the Sparrow tells her she has to convince her grandmother to join their cult or he will be forced to kill her. Margaery heads straight to her, scary nun in tow, but tells her not to repent but to leave – flee, her eyes entreat, and she presses a paper into Olenna’s hands. Grandma is relieved to find the sketch of a rose, proof positive that Margaery is not a convert, but a covert operative. She’s doing all of this for her family. 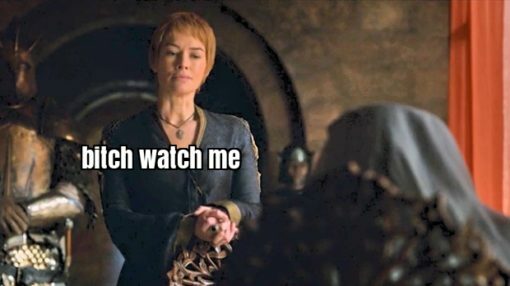 Before Olenna gets out, however, an increasingly desperate Cersei tries to get her to join forces. 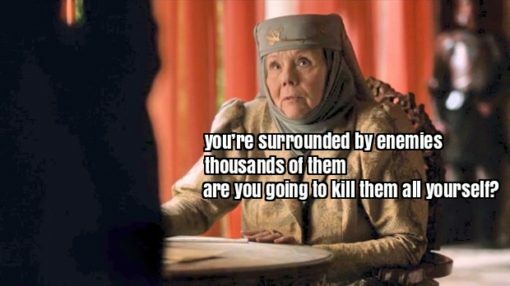 Instead Olenna uses the opportunity to show Cersei exactly how alone she is, and how she has no one to blame but herself. It’s an interesting scene. Olenna is leaving because she trusts Margaery. Cersei is refusing to leave because she doesn’t trust Tommen, or anyone else. She admits the Sparrow’s reign is all her fault – she invited the Hyenas into the Pride Lands and now they’ve taken over – but she’s not ready to admit defeat. She wants to watch the world burn. Jaime, resplendent in his Lannister armor, and Bronn are reunited for a new road trip to Riverrun. There they find the ridiculous Freys putting on a show for the Blackfish, and the audience, in which they threaten to first hang and then slit the throat of my poor Edmure. It’s not clear in the scene, but in the book this is a daily ritual and I thinkwe’re supposed to believe it is here, too, and that Edmure is not really in danger. He is not slain but instead set to be returned to his cell. 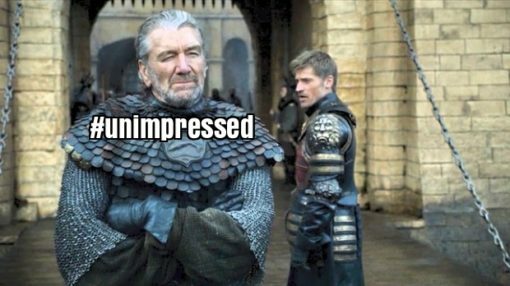 At which point Jaime interferes, takes over, and asks to treat with Brynden Tully. Jaime looks visibly tired as he explains the war is over, the Tullys lost, thousands will die if they battle it out and all he wants is for the madness to end. He tries to stand on his honor, and is reminded yet again he doesn’t have any honor left. He lost it years – a lifetime – ago, when he was a kid and was asked to kill his father but killed his king instead. I think if anyone should abandon his life and turn to religion it’s Jaime Lannister, he’s clearly exhausted of trying. In the North it becomes clear that before Jon can convince the Houses of the North to join up with his army of wildlings he has to convince the wildlings to be his army. Tormund makes a stirring speech pointing out that Jon literally died for them but it’s the last giant’s one word endorsement – “Snow” – that really does the trick. But Sansa is an aristocrat once betrothed to a king. She’s been groomed to believe her Stark blood is worth something, that it’s the reason she’s still alive, the reason she was sold to first Joffrey and then Tyrion and finally Ramsay. She spends the episode trying to assert herself as an heir to power but the Stark name isn’t worth what it once was. Sansa’s story parallels Cersei here, again, and like Cersei, she’s not willing to let it go. She spies a raven and writes a letter, playing the hand left to her – I’ve no doubt the message is meant for Littlefinger and his army of Arryns. Like she told the Little Lady Mormont, Sansa will do what’s necessary to survive, and advance. Pirate King Yara pausesthe ocean-road trip to Mereenand her queen to confirm she’s a lesbian, and we all rejoice. 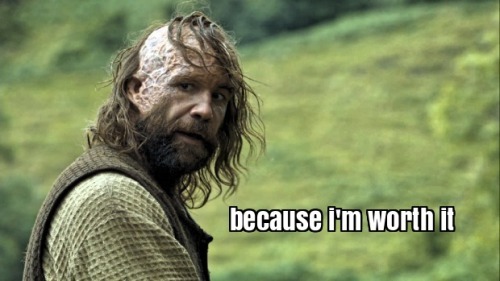 All except Theon who is sad and lonely and consumed with guilt. Yara is over it, she’s on a mission to make a pact with the dragon queen and take back the Iron Islands, and she needs him whole. I hate that she bluntly tells him to either kill himself for real or buck up and join her crusade. But I like very much that Yara legitimately cares about her brother and Theon honestly wants to both atone for his sins and support his sister.